We hear a lot about US stocks having more cash than ever, and being in good shape. Let’s quantify that. The data in this post show that US non-financial stocks and the S&P 500, as a dominant subset, are in better liquidity condition than they were before the 2008 crash, and are in better financial shape to weather adverse conditions that could lie ahead in the event of further global economic slowing. They have strengthened liquidity, lower cost of debt capital (due to refinancing and new debt at current low rates), and generally historically high profit margins. Central banks are on hair trigger readiness to pump liquidity into the system. These three tables present the liquidity (cash plus short-term investments) and total liabilities of US stocks, of the S&P 500 and of US stocks excluding the S&P 500 for the most recent quarter ended June 30, 2012, and for the last 7 completed fiscal years. Because fiscal years vary by company (generally, December, March, June, and September), the fiscal years do not all end at the exact same time. However, fiscal years 5, 6 and 7 represent the periods before the 2008 crash. US non-financial stocks have liquid assets greater than 15% of total liabilities, which is higher than the pre-crash period. The level is down somewhat from a peak two fiscal years ago (generally 2010), due primarily to an increase in borrowing. The S&P 500 are in better shape that the US stocks as a whole, but the pattern is somewhat different. They are in a better liquidity condition than fiscal year 6, but a bit less than fiscal year 7 — still good and still better than the crash period. Their liquidity is also reduced somewhat, but in this case, more of a combination of increased borrowing and reduced liquid assets. The 600+ stocks that do not include S&P 500 stocks, are in better liquidity condition than prior to the 2008 stock market crash, and they also have a reduced liquidity to total liabilities versus their peak two fiscal years ago. In their case, however, they continue to increase total cash and short-term investments while increasing borrowings. These are not recommendations, merely illustrations of ways to create exposures that approximate the liquidity to total liabilities presented in the tables above. WisdomTree has a US dividends weighted ETF that excluded financials, but it has only about 90 stocks (symbol DTN). For the broad US stock large-cap stock market ex-financials, one could own the Russell 1000 index ETF (IWB) and short the S&P 500 financial sector ETF (XLF) to substantially neutralize the financials exposure. For the S&P 500 excluding financials, one could own the S&P 500 index in an ETF (SPY, IVV or VOO) and short the S&P 500 financial sector ETF (XLF) to neutralize the financial exposure. Owning the S&P 500 and shorting one of its sector ETFs (or simply owning selected S&P 500 ETFs) is a way to create a carved out exposure to preferred S&P 500 stocks. The latter approach creates more positions, but allows not only exclusion of certain sectors, but also to weight them differently than in the larger index. 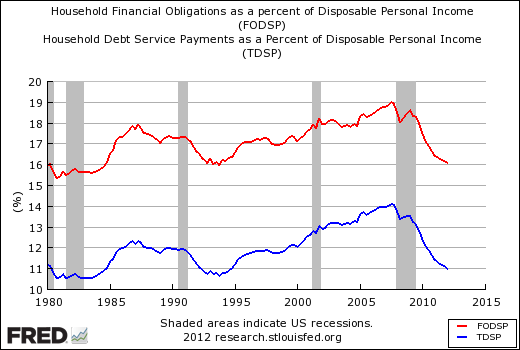 At the same time that corporations are in better financial condition, households have a lower debt service burden, and a lower total financial obligations burden, as a percentage of disposable income than before the 2008 stock market crash, as the chart from the St. Louis Federal Reserve shows. The household debt service ratio (DSR) is an estimate of the ratio of debt payments to disposable personal income. Debt payments consist of the estimated required payments on outstanding mortgage and consumer debt. The financial obligations ratio (FOR) adds automobile lease payments, rental payments on tenant-occupied property, homeowners’ insurance, and property tax payments to the debt service ratio. This and every post on this blog is subject to our general disclaimer. As of the date of this post (Septebmer 4, 2012), we have positions in SPY. This entry was posted on Tuesday, September 4th, 2012 at 2:19 PM and is filed under Analysis, Data. You can follow any responses to this entry through the RSS 2.0 feed. Both comments and pings are currently closed.